All right so I'm still doing job training. One more week to go. Hallelujah. And because I'm so busy with homework I'm getting my lazy on and bringing back the guest review. It is from a blogger named "Just Some Guy" and his blog is theomniscientthey. I saw this movie this past weekend and I couldn't agree with this guy more. So enjoy, and I promise I will do a review soon, whether you want me to or not. This isn’t the first time Martin Scorsese has dealt with mental illness. Next to gangster flicks I’d say it’s his favorite topic. This time around instead of the loner vigilante Travis Bickle or the mad genius that was Howard Hughes we are introduced to the elusive Andrew Laeddis. That’s all I’m saying about Laeddis since half the fun of this thriller is figuring the complexity that is Andrew Laeddis. With Shutter Island, Martin Scorsese has crafted a trippy, haunting, disturbing, painful, and even beautiful film that hangs with you long after the lights come on and you step out into the real world. The thing you’ve got to love with a director of Scorsese’s caliber is that you know everything is going to be top notch from the music; which is not Scorsese’s usual compilation of the best in classic rock and blues (somehow “Gimme Shelter” just wouldn’t quite fit into this flick); to the acting, and to the cinematography. 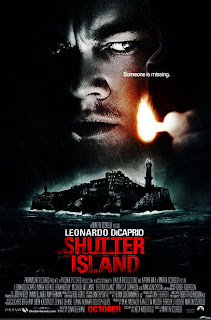 The movie begins with two federal marshals; Teddy Daniels, played by Leonardo DiCaprio and Chuck Aule played by a likeable Mark Ruffalo approaching the enigmatic Shutter Island which is home to an institution for the criminally insane. Teddy and Chuck are there to investigate the mysterious disappearance of one of the institution’s more dangerous inmates. DiCaprio’s Daniels comes to Shutter Island haunted by demons of his own as he is tormented by nightmares of his deceased wife, Dolores played by the beautiful Michelle Williams. The scenes with Teddy and Delores are the most affecting and visually stunning. There is so much pain between the two former lovers as they are engulfed in the tortured dreams of Teddy Daniels. The dream sequences are some of the best since Eternal Sunshine of the Spotless Mind. The acting and chemistry is so great between these two in their few scenes that it stirred up the ghosts of this reviewer’s ex loves, which is quite an accomplishment since this story is about as far from a love story as you can get. As the film continues with Teddy becomes suspicious and frustrated that all of the employees on the island seem to know more than they are willing to tell as they continually refuse to cooperate in his investigation. The music is unsettling throughout building tension and creating anxiety as the movie works its complicated path to conclusion. Of course there are no perfect films and this one does have its weak points, mostly in the plot. There are too many clues dropped throughout the film that prevents the film’s twists from having that Sixth Sense effect on the viewer. However it is a very strong and I should say deeply disturbing film. This one is not for the kiddies, grandma, or the faint of heart. It’s for all those who can handle their art being both brutal and stunning. For a follow up to The Departed it’s another great addition to Scorsese’s legendary body of work.